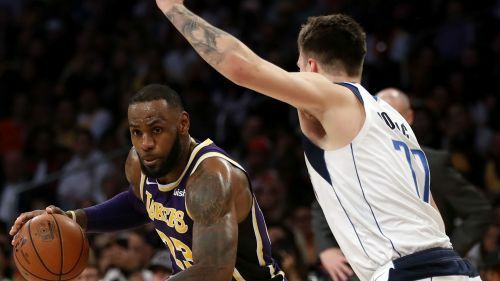 Dallas Mavericks teenager Luka Doncic has revelled in comparisons with "idol" and Los Angeles Lakers superstar LeBron James. Rookie of the Year favourite Doncic has not been a part of the NBA for long, but many already have compared the 19-year-old sensation to James. Doncic led the Mavericks to a 122-119 victory over the New Orleans Pelicans on Wednesday with 21 points, nine rebounds and 10 assists. He was just one rebound short of becoming the youngest player in NBA history to record a triple-double. It marked the third time in five games that Doncic posted a stat line achieved only by James among NBA teens. "I mean, it's amazing," Doncic said of the comparisons. "You all know that he's my idol, so it's just amazing to be there. "That's special, special to me. ... I see what they say, so it's like even more and more energy to work harder to be a better player." Mavericks team-mate Dirk Nowitzki, who has been with Dallas for 21 seasons and has seen his fair share of rookies emerge through the ranks, gave credit to Doncic's maturity on the court. "I say it all the time: He's playing more like a multiyear veteran than a 19-year-old rookie," Nowitzki said. "He's made a name for himself. Any time you're known by just your first name after just a few months in the league, that's a great sign." Doncic has averaged 19 points, 6.7 rebounds and 5.1 assists through 32 games, all of which he started. Early on, at least, his rookie stats are eerily similar to James' rookie year when he averaged 20.9 points, 5.5 rebounds and 5.9 assists.